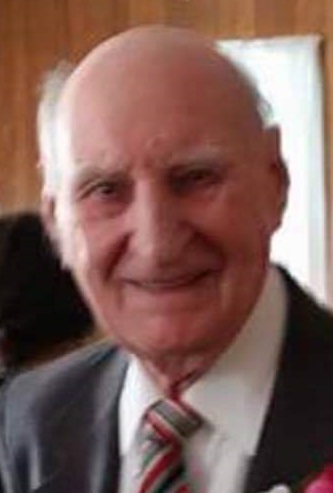 Obituary for Joseph C. Bankovic | Lynch-Green Funeral Home, Inc.
Joseph C. "Bankie" Bankovic, 99, a resident of Ridgmont Assisted Living in Ridgway and formerly of 345 W. Mill Street, St. Marys, died on Friday, April 12, 2019. He was born on March 25, 1920, in St. Marys, a son of the late Lattimer and Eva Frkonja Bankovic. On December 31, 1949 in St. Marys, he married Marie "Pete" Haberberger, who preceded him in death in 1987. He is survived by a granddaughter; Tina Steffan of St. Marys, two great-grandchildren; Evan (Amber) Schutz and Bryce Gabler, and by two great-great grandchildren; Danica and Tayla Schutz. He is also survived by his son-in-law, Edward Schutz, Jr. of St. Marys. Mr. Bankovic was a lifelong resident of the area and served in the U.S. Navy from 1942-1945 during WWII. He retired from Quality Components in 1985 after many years of service. He was a member of the American Legion. Always an avid sports fan, Bankie enjoyed spending time with his family, especially attending their sporting events. In addition to his parents and his wife, he was preceded in death by his daughter; Mary Jo Schutz, who preceded him in death on May 18, 2018; by five sisters; Kathryn Stauffer, Barbara Fleming, Anne Bickmire, Rose Bankovic and Mary Lou Bankovic, and by three brothers; Paul, Walter, and William Bankovic. Funeral Services for Joseph C. Bankovic will be held on Tuesday, April 16, 2019, at 10:00 AM at Lynch-Green Funeral Home. Visitation will be held at the Lynch-Green Funeral Home on Tuesday, April 16, 2019 from 9:00 AM until the time of the service. Military Honors will be accorded by the St. Marys Servicemen's Burial Detail. Memorial Contributions may be made to WRC Home Solutions Hospice or to Ridgmont Assisted Living.